Washington Independents isn't a third party but will support independent, centrist candidates unaffiliated with any political party. The new political action committee is affiliated with a national group. In this era of angry partisanship, is there an opening for independent, centrist candidates to get elected? 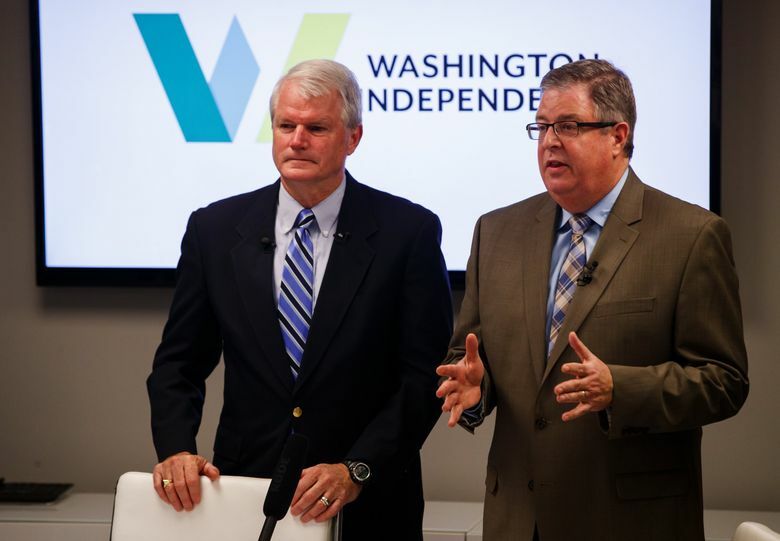 The group, Washington Independents, isn’t a third party but will support independent, centrist candidates. The new political-action committee is affiliated with the national Centrist Project. Baird and Vance are co-chairs of the group’s 12-member board, which also includes former Democratic state Rep. Larry Seaquist of Gig Harbor and former Medina Mayor Michael Luis. Baird, a moderate Democrat who represented Southwest Washington’s 3rd Congressional District for six terms until retiring in 2011, said he’s heard from voters who want alternatives to “extremes” offered by the major political parties. “They don’t like the anger and the vitriol and the divisiveness,” Baird said at a sparsely attended news conference with Vance Thursday in Seattle. Baird still considers himself a Democrat but said the party’s leadership has grown increasingly out of touch with many Americans. He pointed to the re-election of Nancy Pelosi as leader of the U.S. House Democrats despite a record of political failure. Vance, a former state legislator and Metropolitan King County Council member who served as state Republican chair from 2001 to 2006, quit the GOP this year out of disgust with President Donald Trump. “The American people are hungry for an alternative to the status quo, to the dysfunction and the gridlock in the two political parties,” he said. Vance defined the centrist group as “fiscally conservative, pro free enterprise, socially tolerant, environmentally responsible.” Baird added there will be no specific litmus test for candidates. It’s not clear where Washington Independents will field candidates in 2018. Vance said Washington’s top-two primary system could give independents a good shot at competing in legislative districts where one of the two major parties is weak. Baird and Vance said the centrist movement believes in a “fulcrum” strategy, whereby even a small group of independents could wield significant power in a closely divided legislature or Congress, forcing both parties to come to the table and negotiate. But that assumes independent candidates can overcome historical headwinds and get elected. Despite frequent voter grousing about the two major political parties, Washington’s legislative and congressional delegations have been dominated by Democrats and Republicans for a century. (The last third party presence in the Legislature was the Progressive Party, whose members held a smattering of seats in the 1910s and 1920s). Their fledgling movement also will be competing with deep pocketed establishment political parties which poured about $9 million into a single state Senate race this year. By contrast, Washington Independents is getting started with a few thousand dollars from local donors and $10,000 in startup money from the national Centrist project. Still, Vance and Baird pointed to independents elected in other states, including state legislators in Maine and Alaska Gov. Bill Walker, and said they expect a field of new independent candidates in 2018. “Our political system is sick and dysfunctional, and we are going to stand up and try and held change it,” Vance said. Leaders of the state Democratic and Republican parties were dismissive of the new organization.